SIAULIAI, LITHUANIA”No one knows when pious Lithuanians first erected crosses of all sizes on a hill about seven miles north of the city of Siauliai; it may have been after an abortive 1831 uprising against Russian rule over the small Baltic country. Oftentimes, the bodies of Lithuanian patriots killed during that rebellion, and a similar revolt in 1863, could not be found. So their families planted crosses in their memory on a small mound that was eventually covered with memorials. During the countrys brief moment of independence between the First and Second World Wars, citizens of a free Lithuania continued to plant crosses near Siauliai, as the Hill of Crosses became a pilgrimage center. I first became aware of this remarkable place in the late 1970s, when I began to take an interest in the Catholic Churchs struggle for religious freedom in Lithuania, then a republic of the Soviet Union. That struggle was led by some remarkable men and women, including two priests who did time in the Gulag labor camps, Father Sigitas Tamkevicius, S.J., and Father Alfonsas Svarinskas, and a clandestine nun, Nijole Sadunaite, whose small book, A Radiance in the Gulag , remains a moving testament to courage forged by Catholic devotion. The resistance Church in Lithuania produced the longest-running, unbroken underground publication in the history of the USSR, The Chronicle of the Catholic Church in Lithuania , which was typed, copy by copy, on manual typewriters, secretly distributed in Lithuania, and then smuggled abroad, where it was translated into English by Brooklyn-based Lithuanian Catholic Religious Aid. In the mid-1980s, working with my friend Congressman John Miller, I helped organize a Lithuanian Catholic Religious Freedom Caucus in the U.S. House of Representatives. The caucuss bipartisan membership pressed the Soviet authorities to release Lithuanian Catholic prisoners of conscience, engineered a Congressional resolution in support of Lithuanian independence and religious freedom in 1987, the 600th anniversary of Lithuanias baptism, and marked that event with a public reception in the Capitol that was broadcast to Lithuania on Radio Liberty. By the time the Soviet Union imploded”Lithuania leading the way with its 1990 declaration of independence”Father Tamkevicius, Father Svarinskas, and Sister Nijole were free, and the Church was widely recognized as a major factor in Lithuanias successful struggle to maintain its national identity and cultural integrity. 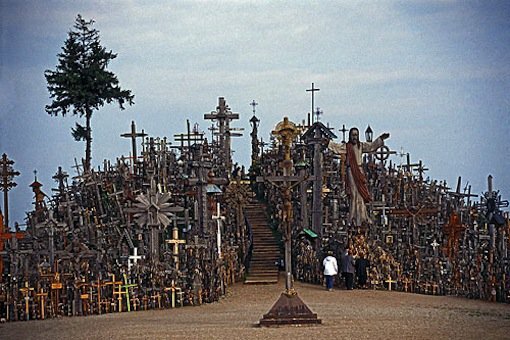 Throughout the difficult years, I was fascinated by the Hill of Crosses. Time after time, the Soviets took down the crosses, bulldozing the site on several occasions. And each time the crosses, large and small, went back up”a dogged display of religious conviction and political courage that embodied a small, beleaguered nations refusal to kowtow to atheistic propaganda and totalitarian power. Sigitas Tamkevicius has been the archbishop of Kaunas since 1996; Alfonsas Svarinskas, now a monsignor, is retired but still feisty and active; Sister Nijole continues to radiate the joy of consecrated life in Vilnius. It was wonderful to see each of them during a recent visit I made to Lithuania to help the Church celebrate the 20th anniversary of John Paul IIs 1993 visit. There were numerous events commemorating that epic pastoral pilgrimage: in the parliament, in the Vilnius cathedral, at universities in Vilnius and Kaunas, and at the great Marian shrine at Siluva. I hope that, through these events, Lithuanian Catholicism looked back in such a way that the path forward, to the free and virtuous society to which John Paul II called Lithuania, came into clearer focus. From a personal point of view, however, the most moving moment in a week of commemorations was my visit to the Hill of Crosses. Some count 100,000 crosses there now; the exact count makes no difference. At Siauliai, in what John Paul II called the land of crosses, the tradition of looking at history, and our lives, through the prism of the cross and its mystery of redemptive suffering continues. I planted a small cross in memory of the martyrs for religious freedom who lie in unmarked graves across Siberia, and prayed for those who defend the first freedom today.